What? The United Football League — Who? Have you ever heard of the United Football League? I guess I should be more specific. I’m talking about the second tier American Football League founded in 2007, NOT the United Football League Philippines founded in 2009 (though that’s also intriguing, and might have more talented players). The UFL was not unique it what it sought to do, but the manner in which it approached it and the swift collapse makes for an interesting case study. But if you have no idea what the UFL is (or was), let me help you with a little background information. What was the UFL Objective? The United Football League was “said to be” established to fulfill an under-served market in major cities, or states, who did not have a professional football team. However, two of the first four teams established were in cities with already had existing professional teams (one of which already having TWO teams) – New York and San Francisco. The popularity of American Football is hard to dispute. The sport makes billions for the National Football League (NFL), paying NFL commissioner Rodger Goodell $40 million. Although the United Football League never publicly admitted their true intentions, the UFL had hoped to create a relationship with the NFL by trying to find common ground, perhaps as a developmental/supplemental league or some sort of “minor league”. In some ways, this made sense. Traditionally, NFL teams would sign players to fill gaps who weren’t currently on an NFL roster, which often meant they weren’t immediately available at full football conditioning, or immediately ready to handle the mental aspects of the game. The UFL thought to overcome this by stocking their roster with former NFL players trying to get back into the league, as well as undrafted college players with the ability to play at a professional caliber. Playing games currently with the NFL seasons would keep these players “football ready” and would also allow them to catch recognition by the NFL. In this way, the UFL would act as the NFL’s “minor league,” developing players who are deep in talent but lean in technique and production and having them immediately available to sign and contribute to an NFL team (though late in the season, as I’ll discuss below). This explains the UFL’s creation of a Fall/Winter league, which competed directly with the NFL, college and high school football season. Previous leagues, like the United States Football League, which was founded in 1982, played during the Spring and Summer. The UFL protected their interests by placing a clause into each players contract, restricting any movement out of the UFL until the season was over. This would explain the UFL’s six game season and playing their championship game in November, allowing UFL players to enter into the NFL for late season contracts. The UFL had an initial $150K transfer fee, which was later lowered to $25,000, for a player to move into the NFL. And Who Developed and Managed this League? The league was under the general direction of former Wall Street figure William Hambrecht. The first and only commissioner was Micheal Huyghue, a former executive for the Jacksonville Jaguars. What Teams were in the UFL? When did the UFL Play Games? In 2009-2011, the UFL games were scheduled on Wednesday, Thursday, Friday and Saturday nights. The six-game season lasted eight weeks, with one Championship game. In 2012, the UFL was scheduled to play Wednesday and Friday. The six-game season lasted eight weeks with one Championship game. The games were televised on Versus and HDNet. In 2012, the UFL secured a contract with CBS TV. How Much did UFL Players get Paid? In addition to paying all housing expenses for all players. In 2010, players received $6,250 for each game ($50,000 annually), with the starting quarterback earning $200,000 annually. Participants in the Championship games were paid $10,000 each, with an additional $10,000 to each player of the winning team. In 2011, the the base salary was reduced to $5,000 a game, with an additional $1,000 for winning the Championship game. In 2012, the base salary was reduced to $3,500. All players signed only one year contracts. Unfortunately, the UFL didn’t plan it’s grand opening at the most opportune time as the country was in a time of economic hardship. 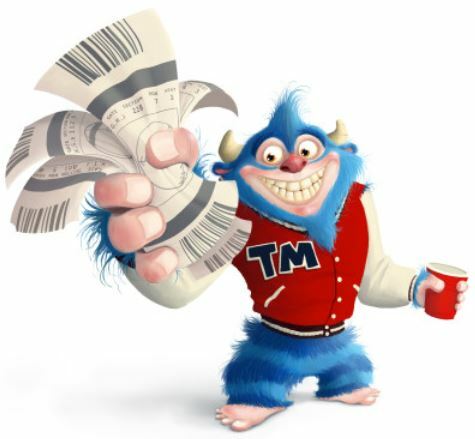 The UFL had problems attracting wealthy investors from the beginning. Financial problems continued throughout the leagues existence with the financial economic structure unable to stabilize. The league had to delay payment of players and vendors after the 2010 season. The November 2010 Championship game bonuses weren’t able to be paid until March of 2011. And over the course of four years, the league accrued financial losses of $120 – $150 million. The UFL was unable to create a fan base due to poor marketing and general lack of interest. The UFL was unable to nationally broadcast the game, making it even more difficult to attract or retain fans. The UFL had too much competition. 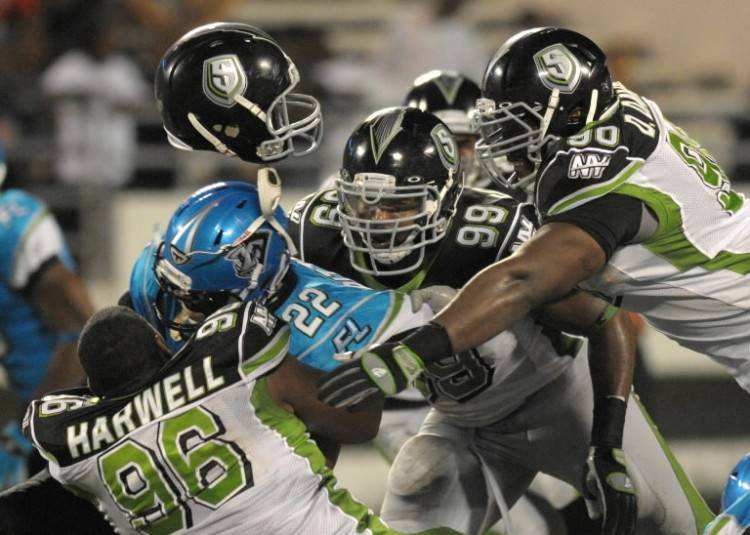 Having a Fall/Winter season, the UFL competed with the NFL, college and high school football, all of which were televised on major and local networks and had established fan bases. BJ Sams (Wide Reciever) – California Redwoods – undrafted in 2004, Sams signed with the Baltimore Ravens in 2004 and played with the team until 2007. Mike Doss (Safety) – Orlando Tuskers – drafted by the Indianapolis Colts in 2003 in the second round and was released in 2006. Larry Tripplett (Defensive Tackle) – Orlando Tuskers – 2002 second round draft pick by the Indianapolis Colts. Adam Archuleta (Strong Safety) – Las Vegas Locomotives – 2001 first round draft pick by the St. Louis Rams. Ken Dorsey (Quarterback) – New York City Sentinels – 2003 seventh round draft pick by the San Francisco 49ers. Brook Bollinger (Quarterback) – Orlando Tuskers – 2003 sixth round draft pick by the New York Jets. JP Losman (Quarterback) – Las Vegas Locomotives – 2004 first round draft pick by the Buffalo Bills. Losman played his entire career with the Bills, finishing his career with 33 touchdowns, 34 interceptions, 6,211 passing yards and a quarterback rating of 75.6%. Josh McCown (Quarterback) – Hartford Colonials (2010) – 2002 third round NFL draft pick by the Arizona Cardinals, released in 2006. McCown finished his 2010 season passing for over a thousand yards and was the highest ranked passer. Before signing with the UFL, McCown played for the Detroit Lions, Oakland Raiders, Miami Dolphins and Carolina Panthers. After the 2010 season with the Hartford Colonials, McCown signed briefly with the San Franscico 49ers before being signed by the Chicago Bears from 2011-2014, sitting behind Jay Cutler. McCown played the second half of the 2013 season after Cutler suffered a groin injury, finishing the season with a 109 passer rating, the third highest behind Peyton Manning and Nick Foles. 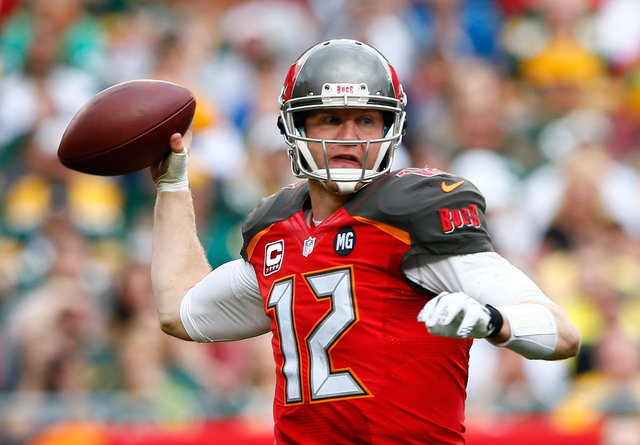 McCown signed a two-year contract with the Tampa Bay Buccaneers in 2014 and was released after one season due to poor performance. McCown is currently signed to a three year contract with the Cleveland Browns. Herb Taylor (offensive Tackle) – Las Vegas Locomotives – 2010 UFL Championship – signed with the Green Bay Packers. American Football means a lot to the players, as well as the fans. For those professional athletes that are unable to play the game, the UFL was a second chance. Maurice Clarett, now 31, was a running back that helped bring Ohio State to the 2002 Championship. At 27 years of age, he never thought he’d play football professionally again after pleading guilty to aggravated robbery and carrying a concealed weapon in connection with a hold-up in a Columbus bar and spending the last three and a half years in prison. Clarett never made it in the NFL, after being suspended for taking improper ‘gifts’ valued at thousands of dollars while attending Ohio State. Clarett was deemed ineligible to play the following year at Ohio State, and his petition to enter the NFL draft early was denied. Clarett knew he’d never play in the NFL, but was glad for the opportunity to play in the UFL for the Omaha Nighthawks. People often don’t appreciate what they have until they lose it. Organizations like the UFL, the USFL and the Canadian Football League (CFL) have and are giving players opportunities that they might not otherwise have available. The CFL, founded in 1958, is seeing significant success outside of the NFL and provide significant opportunities for its players. In 2014, the most current attempt at a second tier professor football team was created by Brian Wood, the Fall Experimental Football League. 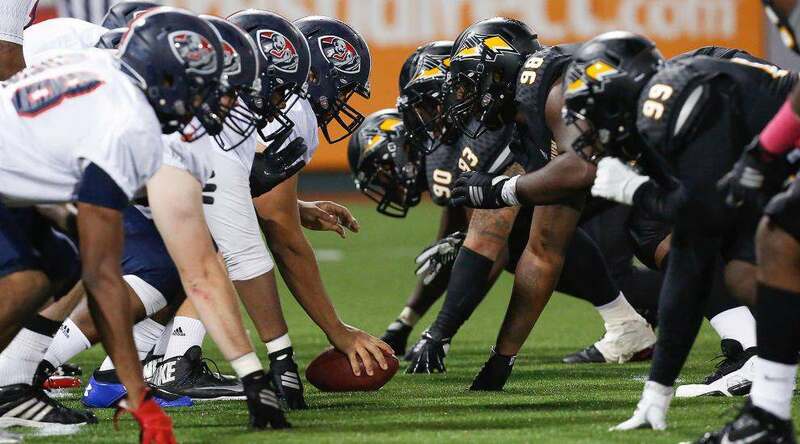 The FXFL is also seeking to be a feeder league into the NFL. 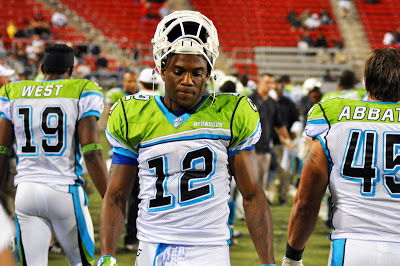 The FXFL 2014 season was cut short, leaving one game and the Championship game unplayed. Wood is optimistic about the 2015 season. The team currently has four teams the Boston Brawlers, The Brooklyn Bolts, the Omaha Mammoths and the Blacktips (who currently have no home). Although no one knows the real goal for the establishment of the UFL, one thing is for certain, the UFL was established to make money. Paul Pelosi, husband to former House Speaker Nancy Pelosi, didn’t invest millions to get nothing in return. Maybe the reason for failure is that there is no longer anymore room for American Football in America. Or perhaps it’s simply that there’s no more room for American Football outside the NFL. Whether that’s a good or bad thing I’ll leave for you to decide.